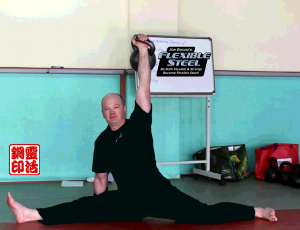 At Flexible Steel we are constantly looking for better ways to teach stretching and strength. We believe that you cannot rightfully have one without the other. During the certification we make a big point about using the 3S of movement. The Ss’ are applied to enhance stances, stretches, or movements, loaded or unloaded. It does not matter if your are doing a heavy deadlift or a simple unloaded toe touch….applying the 3S will make your performance better. Better should be read as safer and more effective. The second S stands for make “space” inside your body. When we apply this to a split we get instant results. The cue I normally use is “grow the points of your triangle away from each other.” What does that mean? If you look at the above photo…my front foot is one point of a triangle, my back foot is another and finally in this case, where I am pressing, my hand with the bell is the top point of the triangle. Note: if you are not pressing…the top of your head becomes the 3rd point. To get instant gains try to push all three points away from each other at the same time. Use some muscle to get the job done. What you will find is you move deeper into stretch without much discomfort. Try it, you will like it. Learn many more tips and tech at a Flexible Steel Cert near you. Check out our upcoming schedule and get to a cert today. Next one in the US is Texas. 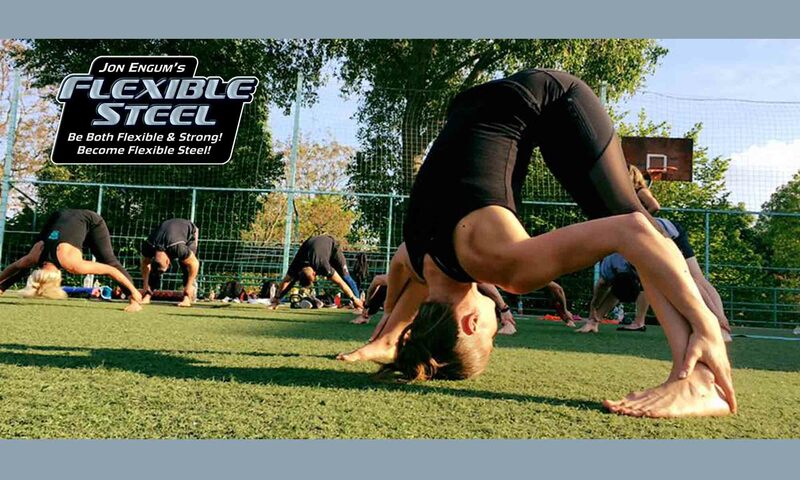 Previous PostPrevious The Grand Prize Winner of the Flexible Steel Challenge is….